Spain is country with a mixed and complex heritage and Spanish cooking reflects this fact. While Spain is a Mediterranean country, and many Spanish dishes owe much to this, Spanish food also includes native foods imported into the country from Spain's former colonies in the New World such as beans, peppers, potatoes and tomatoes. Other Spanish dishes draw on the countries Jewish and Moorish heritage - it was worth remembering that much of Spain was ruled by the Moors for more than seven hundred years. Even the Reconquista (the Christian reconquest of the Iberian pennisula from Muslims) has left its traces in Spanish cuisine - pork is popular in Spanish food, and historically was a political statement of Christian identity because it was not eaten by Jews or Muslims. The most important ingredient in Spanish cooking is olive oil, which is unsurprising when you consider the fact that Spain produces almost half of the world's olives. However, in the North of Spain, butter and lard are also used. Other characteristics of Spanish food, include the widespread use of garlic and onions, the serving of bread and wine with most meals, and the consumption of fruit or dairy products as desserts. 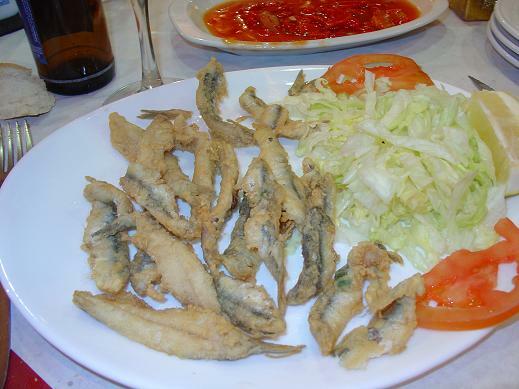 One particularly well-known Spanish custom is the serving of small appetizers ("tapas") with drinks. Chorizo - A spicy sausage made from fatty pork seasoned with chili and paprika. There are two varieties: hot ("picante") and sweet ("dulce"). Most varieties can be eaten cold, although there are regions of Spain which produce varieties that need further cooking. Chorizo is not only eaten on its own, but is also used as an ingredient in other dishes. Fabada Asturiana - A bean stew that also contains black blood sausage ("morcilla"), chorizo and pork, and which is flavored with saffron and other seasonings. Gazpacho - A cold vegetable soup that is particularly popular in hotter areas such as Andalusia. Traditionally gazpacho was made stale bread, garlic, olive oil, salt and vinegar, but today, bell pepper and tomato are also often added. There is also a variant called gazpacho manchego which is served warm, and that includes meat (often rabbit) and mushrooms, and is more like a stew than a soup. Jamón serrano - Dry-cured ham. Marmitako - A fish stew made with onions, pimentos, potatoes and tomatoes. Olla Podrida - A rich stew with bacon, poultry or game, ham, meats and vegetables. 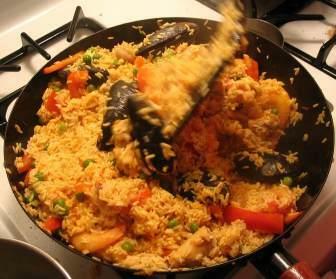 Paella - A rice dish originally from Valencia. The main ingredients are rice, saffron and olive oil, and the dish is usually garnished with meat or seafood, and vegetables. 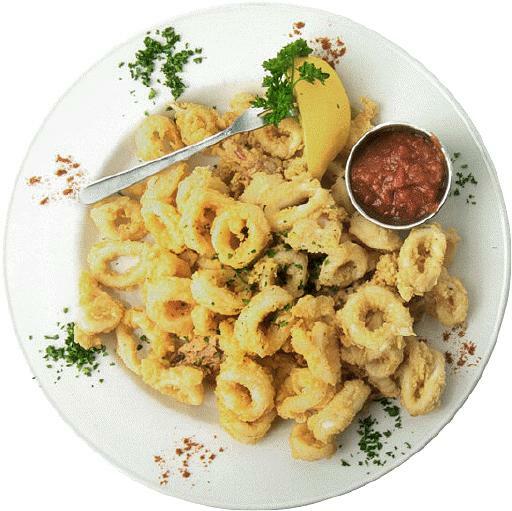 Pesca�to Frito - Marinated fish, battered and fried. Tortilla de patatas - An onion and potato omelette. Cristina Curp, the creator of the popular food blog and wellness site The Castaway Kitchen, delivers everything you need to do away with diets and discover the right nutritional path for you in her new book, Made Whole. Made Whole is a comprehensive cookbook and resource guide that combines the Paleo approach with the low-carb/ketogenic diet, using only whole, natural, unprocessed ingredients. Cristina includes all the tools you need to be successful on a ketogenic diet, along with advice and how-tos for using the keto template to eat intuitively and develop a personalized nutrition plan based on your unique needs. Each recipe is free of grain, gluten, sugar, and dairy, along with nuts, starches, nightshades, and alcohol—making this a perfect cookbook for those following keto, Paleo, low-carb, AIP, or allergen-free diets. Cristina’s eclectic and mouthwatering recipes draw inspiration from international cuisines to keep cooking fun and exciting. You will feel like a gourmet chef with easy-to-make meals prepared from accessible ingredients that you can find at your local grocer using just the one master list that she provides in the book! Made Whole is a user-friendly guide to cooking beautiful food, eating well, and enjoying every last bite, while reaching your health and fitness goals. Made Whole will teach you that healthy food doesn’t have to fit into a certain label, box, or idea of what it should be. Once you begin to forget about what you can’t eat and embrace the wonderful and delicious things you can eat, you will find freedom and pleasure in fueling your body with the most exceptional sustenance that nature has to offer. Want to learn the Spanish language? You need QuickStudy Spanish Vocabulary flash cards. 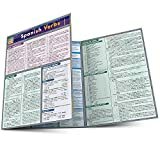 With 1,000 cards that contain English to Spanish words in over 17 categories, it's a great study tool. Katie Button debuts her first cookbook ever as a peek inside the kitchen of her award-winning restaurant, Cúrate. This cookbook features 125 recipes celebrating the vibrant flavors and broad appeal of Spanish food. Button brings the cuisine at Cúrate into the kitchen of every home cook, showing readers how to re-create classic Spanish dishes and adapt them using American seasonal ingredients. From cherished traditions (Tortilla Española; Chicken Paella) to mouthwatering new favorites (Ham and Cheese Stuffed Fried Pork Chops; Ribeye Steak with Blue Cheese Sauce) to celebratory drinks and desserts (The Perfect Gin and Tonic; Almond Cake with Cream Sherry and Brandy), Cúrate brings Spain to you. Basics of Spanish verbs in our easily accessible format. Yet Basque Country is more than a little inaccessible—shielded by a unique language and a distinct culture, it’s an enigma to most outsiders. Until now. Marti Buckley, an American chef, journalist, and passionate Basque transplant, unlocks the mysteries of this culinary world by bringing together its intensely ingredient-driven recipes with stories of Basque customs and the Basque kitchen, and vivid photographs of both food and place. And surprise: this is food we both want to eat and can easily make. It’s not about exotic ingredients or flashy techniques. It’s about mind-set—how to start with that just-right fish or cut of meat or peak-of-ripeness tomato and coax forth its inherent depth of flavor. It’s the marriage of simplicity and refinement, and the joy of cooking for family and friends. The highly anticipated first book on the Etxebarri restaurant, considered one of the best grills in the world. Bittor Arginzoniz has achieved world fame as a grill genius with his restaurant Etxebarri, located in the farming community of Axpe, a tiny village nestled beneath mountains an hour’s drive southeast of Bilbao. When he bought the restaurant building in the centre of the village more than twenty-five years ago, he and his family rebuilt it entirely themselves. He is self-taught and has only ever worked in one kitchen – his own – where he designed and built his famous adjustable-height grills. With no other reference than the oldest culinary technique in the world ̶ fire ̶ he grills using utensils designed by himself, uses specific woods and has an obsessive search for the best product, Arginzoniz has revolutionized the way people roast meat, fish or vegetables. He cooks everything over a grill ̶ even dessert ̶ so everything has a unique taste to it. Michelin awarded Asador Etxebarri a Michelin star in 2010, describing the food as ‘an unadulterated pleasure for lovers of simply grilled and roasted dishes…’ and he is ranked number 6 in the San Pellegrino World’s 50 Best Restaurants 2017. He rarely leaves the restaurant except to tend to his farm animals, which supply many of the raw ingredients for his tasting menu. This book describes the man, his kitchen and his recipes in words and stunning photography. "A shrub is exactly what the people who invented the phrase 'slake your thirst' had in mind. A shrub is full of character and variety. The ingredients―fruit, sugar, and vinegar―are as simple as can be. But the variations are seemingly unlimited. It has another superpower: A strong shrub game can help you make the most of bruised or aging summer fruit." Michael Dietsch took the mixology community by storm when he brought back a popular drink from colonial times, the shrub. Not the green, leafy kind that grow in the ground, but a vintage drink mixer that can be spiked with alcohol or prepared as a soda. Drinkers, bartenders, and the media embraced the book. This new edition features a foreword by Paul Clarke, the Executive Editor of Imbibe magazine and author of The Cocktail Chronicles. Here is the definitive guide to making and using shrubs.